With a starting jackpot of $8m, you could land a life-changing sum every week - and it's only $2 a game! Bets close 11:00pm AET each Tuesday with results taken from the opening values of selected Financial Market indices at 09:30am ET. No, TUE Jackpot is no longer a bet on the outcome of an international lottery. This 7-from-45 Jackpot allows you to bet on the outcome of Financial Markets such as the Dow Jones Industrial Average and S&P 500. Do I Need to be a Financial Expert to win TUE Jackpot? Tuesday Jackpot gives you a total of seven different prize divisions. You have a 1: 55 chance to win a prize. 2. All bets accepted by Lottoland will be covered via our industry leading insurance agreement or by turnover (sales) taken on the event. 3. 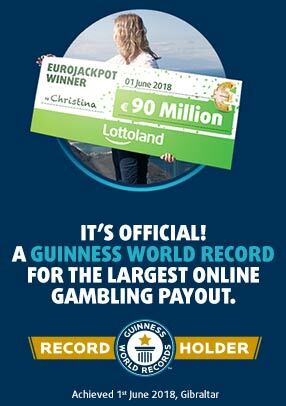 Lottoland has recently achieved a Guinness World Records™ achievement for the world’s biggest online gambling payout! So rest assured, all winning bets will be paid.